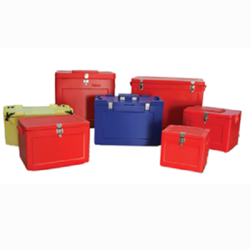 Our product range includes a wide range of insulated puf box. Our cooler boxes are fabricated under the supervision of practiced experts, who use the advanced technology and superior-grade material for enhancing the durability and performance. Made from approved grades of polyethylene materials in double wall construction by a unique molding process Superior grade fittings and hardware, 100% hygienic, Leak proof, rust proof and corrosion free, Strong and durable, Keep the things stored in hot/cold condition for longer period, Available in elegant colors, Built in space to print message logo and brand name. Looking for Insulated Food Container ?